I doubt my parents have ever recognised the value of the primary school education I had and how that seems to have contributed to the makeup of who I am and my personality. I went to three primary schools starting with the Army Children’s School in Kaduna where I spent a year. There are three things I remember about that school, my first day when as soon as my mother and aunt appeared to take me home, I walked out of the class without the school having closed. The Indian headmistress usually had a fingernail inspection and if we had any nails growing, she clipped the back of our fingers with the edge of a ruler. For a kid of just over 5 years of age, it is strange that we were expected to clip our nails, which should have been the responsibility of our parents. I guess the idea was we were punished to the extent that we had to inform our parents of what they need to do, that was my introduction to the rottenness of corporal punishment. The last event was when my father arrived late to pick me up. I got on the school bus and went to sit at the back. Just before the bus pulled away, my dad’s car pulled up, I made no move to get off and he basically followed the bus literally round town before he got attention of the driver and the permission to take me off the bus. I am glad we left Kaduna because my second school, Corona Primary School, Shamrock House in Bukuru, Jos was a completely different place. I joined the school jumping a class to class 3 and had the amazing opportunity for a well-rounded education. Our school was international and followed a more English curriculum as opposed to the rival Hillcrest School that had more of an American system. I remember we had reading, writing and spelling classes beyond the usual lessons. We had many excursions, notably one to the veterinary school at Vom. We had scope to explore, to inquire, to question, to challenge, to debate and to dispute, all teachers were accessible, I never once saw the use of corporal punishment, yet the quality and standard of discipline was high. I think this environment gave me the boldness to have views and opinions with the ability to project those with conviction. Whilst my parents have intimated that I have always been a conversationalist for as long as they could remember, I just knew I could engage anyone in conversation if they were interested enough to want a conversation. The number of difficult and tight spots just being able to speak my mind has gotten me out of are innumerable, I’ve been blessed. Our library was stocked with books I ravenously devoured but I never really liked writing, especially writing letters that seemed to grow on me much later in life. One day, I found a French course book in one of the cupboards in our class and whilst I had no means of knowing the pronunciations, I began to teach myself French. It is quite strange that one is still learning new things from events of over 40 years ago. The line of a song we practiced before a performance I never got to attend, I learnt today was from The Pirates of Penzance – A Policeman’s lot Is not a happy one – it is strange I never bothered to check all this while. After three years in Jos, we returned to Kaduna where I was enrolled in the Sacred Heart Primary School for the sixth year. Though I missed 4 months of school attending common entrance examinations in South-West Nigeria, I was already quite independent minded and more or less able to travel alone and make the necessary enquiries to get anywhere I needed to get to. 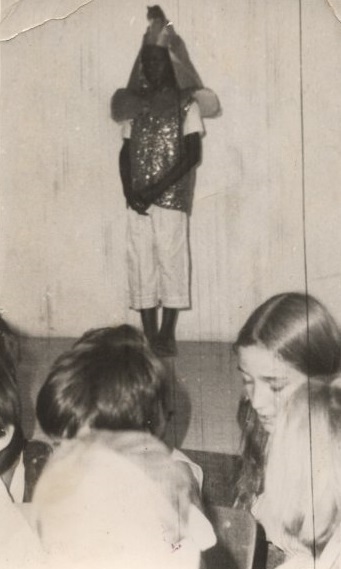 Yet, in that year, I joined painting classes which just helped improve my sense of expression and for some reason I could not explain, I was cast as Pharaoh in our school’s Christmas production of Joseph and the Amazing Technicolor Dreamcoat. One interesting event in my school year was attending a Sharia Court session in Kaduna, we were pupils of a Catholic School with backgrounds too varied to count and yet that was a thing of great interest to us all. What primary school education gave me was a great sense of adventure in learning, a demanding curiosity to understand things, a very inquisitive mind and sometimes I very liberal view of things. The environment in which I studied was quite multiracial, I had schoolmates from all around the world and that gave me a broad worldview of equality in our humanity. They tried to beat that out of many of us with that kind of background in secondary school, but they failed, we were fearless, wily and sometimes too streetwise for our own liking. We were rarely the top of the class in those times, because we could never learn by rote, we had to understand what we were taught and answered questions as we understood what we had learnt. Now, I am not a man of many letters, but nothing can better the quality of foundational and diverse primary school education I was privileged to have. That in my view can be the differentiator in many things and opportunities I have had in life. When we toured the primary schools in that Cape Town suburb just over two weeks ago, it dawned on me again why a good primary school education sets the stage for an amazing life. Very little can compensate for the lack of this foundation, even if that person ends up being very successful in any walk of life.